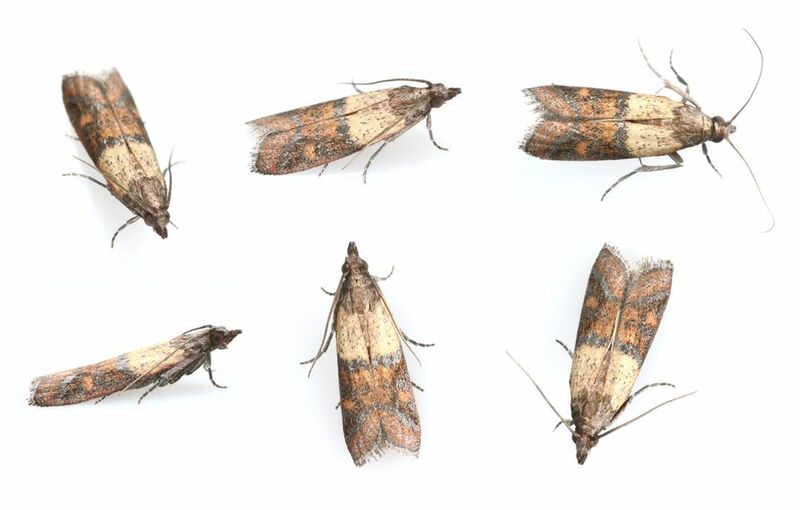 Dealing with a pantry moth infestation? Get rid of them without the use of pesticides. Here's how. Inspect All Food in Your Pantry for Signs of Infestation: Look for larvae in and on food packaging. Also look for webs (as these may belong to moths, and not spiders). Grain-based products, like flour, cereal, pasta, and baking mixes, are a moth favorite, ditto for nuts and sweets. But don't limit your search to these items. You may find larvae tucked into the edges of cans, on spice jars or even in unopened packages and sealed canisters. If you have pets, be sure to check their food, too. Toss any infested foods that you find, and wipe down any affected cans with undiluted vinegar to kill the larvae. Note: Infested items should go straight to your outdoor trash can. Placing them in your kitchen trash will only spread the problem. Give Your Pantry a Thorough Cleaning: Pull out your shelf liners (and wash or replace them). Vacuum the shelves, paying special attention to the corners, undersides, shelf brackets, and mounting hardware. Vacuum the walls, baseboards, trim, floor, ceiling and door (including the inside edge, hinges, and knob). Then, wipe down your pantry shelves with hot, soapy water or vinegar; and mop the floor. When you're done with your clean up, remove the vacuum bag, and take it out to your outside trash bin (wash out the dust compartment, if you used a bagless vacuum). You don't want to harbor moth larvae in your vacuum. If You Have Space, Place Your Grain and Nut Products in the Freezer: Wait until you're confident that you've eliminated the problem. It will prevent further contamination. Also consider storing new groceries in a different spot (i.e., a good distance from the pantry), until you've had time to monitor things for a few weeks. This simple move will keep you from having to throw out (and replace) more food. Still Seeing Moths? Go back over your pantry, and look for spots that you may have missed in your previous clean out. Are there cardboard boxes (opened or unopened) that they could be living in? Have you opened all sealed containers? Did you look behind the paper labels on candy bars and jars? Could they be lurking inside the pages of cookbooks? What about tea bags? Have you checked all of your candy, dried fruit, and nuts carefully? Did you check all the pet food? Have you thoroughly inspected all food items that you haven't used in a while? Do you have any kids' artwork in the kitchen that includes macaroni? What about play dough? Don't stop looking, until you figure out where they're hiding. No More Signs of Moths? Restock your pantry, but continue to check for moth activity on a regular basis. To avoid future infestations, consider storing your flour, baking mixes, oatmeal and nuts in the freezer, or freeze these items for a week before moving them to your pantry. It will kill any larvae that might be present in the foods that you bring home from the store, so you don't introduce them to your pantry. Also, consider storing your grains in mason jars or other tight-sealing containers. This way, If you inadvertently bring food home from the grocery store that contains eggs, the moths won't be able to get out of the jar when they hatch, so you'll only have that one jar of food to throw away. Bay leaves, lavender, cedar, and mint are known to repel moths. Fill sachets with one of these, and tuck them inside your pantry as a deterrent. Replace them from time to time, so they remain effective. Clean up food messes in your pantry as soon as they happen, and give your pantry a thorough scrub several times a year. It will help you to avoid infestations and alert you to any potential problems before things get out of hand. If you maintain a grocery stockpile, be sure to inspect it regularly for moth activity, and to follow the same food storage practices that you follow in your kitchen. You probably don't visit your stockpile near as often as you visit your pantry, so it would be easy for a problem to go unnoticed.